The previous evening had been a fan club only show but tonight the show is open to the public. Unfortunately, due to the previous evenings storms and torrential rain, transport into the countries Metropolis is extremely patchy. This meant a lot of people have decided that the risks of either not making it into town or, more likely, the risk of not getting back out, has taken its toll and the crowd is less than capacity. 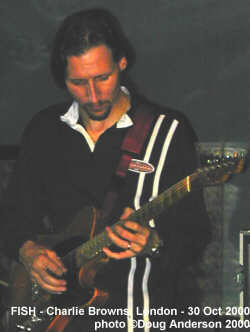 American guitarist John 'Wes' Wesley appeared a few minutes before the rest of the band and started to check the tuning of his guitar. This ran into the first track, JUNGLE RIDE, as the reminder of the band appeared on stage, Fish arriving just in time for the first line of lyrics. No time to draw breath as BROTHER 52 kicked in though I felt the synthesised drums (care of Andy Baker) and 'news soundtrack' voices seemed a bit out of place. New lad John Young (yes, he of Qango and Greenslade) handled the complex keyboard introduction to TUMBLEDOWN well though the 'Haddington Bear' seemed to have a voice problem. An explanation was forthcoming before 'Clutching at straws' medley (HOTEL HOBBIES - WARM WET CIRCLES - THIS TIME OF THE NIGHT) in the form of a tale of drink and dodgy take away food the previous evening. 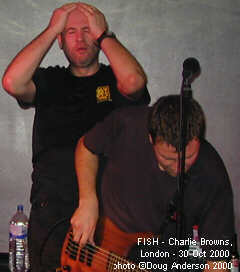 Fish joked about a "new merchandise item: vomit protectors" as the front row took a mental step back. 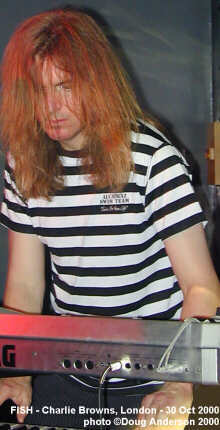 As Fish wiped the ocean of sweat from his forehead he was passed a book from audience entitled "How to make it in the music biz" which he read passages from "to get some ideas" before introducing band (bass player Steve Vantsis being the remaining member). With the introductions over it was time for three more relatively new tracks, PERCEPTION OF JOHNNY PUNTER, WHAT COLOUR IS GOD and half of PLAGUE of GHOSTS before stepping back to the early solo days with another trio of songs, LUCKY, CREDO qnd VIGIL after which mouthed "thank God" to the ceiling and seem in glad to have made it through the set." Instead of vacating the stage Fish explained that it would be "posy if we walked to the back" of the hall, adding "I'd not make it back" so it was straight into the final track of the evening, the sing-along THE COMPANY. This meant, unfortunately, though understandably, that the 'Misplaced Childhood' medley (KAYLEIGH, LAVENDAR & HEART OF LOTHIAN)- was cut from tonights set because of the dodgy stomach of Fish. A disappointment but the show had been enjoyable and much more of a rock show than the last time I caught a Fish (on the Sunset on Empire tour). The music was a little on the disjointed side in places but as it was only the second live outing of the new band (Young and Baker being the 'new boys') I'm sure a few more shows will tighten things up nicely. Would I recommend going to see Fish on the UK tour? Yes, after a few 'wilderness' years, he seems to have found the plot again (maybe in the book handed onstage) and be providing a 'rock' show again. This review was originally published in the Classic Rock Society magazine, Wondrous Stories. This page is Copyright © Doug Anderson 2000 - 2003. Created: 08 December 2000. Last updated: 2 February, 2003.